The inability to sleep is the second most common health complaint internationally (GFK 2015) and is a common problem in shift work environments. Many work environments demand work to be continued through the night. However, human beings are not built to work during the night. Naturally, our body is programmed to ensure that energy, alertness, concentration, and other aspects relating to mental and physical performance peak during the day. This programming is done in our internal biological clock centered in our brain. Receptors in our eyes send information to this internal clock about the color and intensity of light, which keeps it attuned to the natural alteration of light and darkness. Blue morning light is the natural sign for our body’s clock that the day has started. As a response our brain signals our body to remain active. Normally, during nighttime, the lack of daylight promotes our brain to secrete melatonin. This ‘night hormone’ is involved with various aspects of mental and physical rest and recovery. At a normal sleep/wake schedule, our internal biological clock makes us feel sleepy in the late evenings and ensures that we can maintain restorative sleep during the night. When flying across multiple time zones or during the abrupt transition to a night working schedule, the sleep and wake timings of our biorhythm become misaligned with those of the work schedule. This phenomenon is referred to as ‘circadian misalignment’ (see the image below), a mismatch between our internal circadian clock and work, sleep, and eating activities (Scheer et al., (2009). These ‘circadian misaligned’ shift workers have to work when their body prepares to sleep and have to go to bed when their body tells them to stay active. 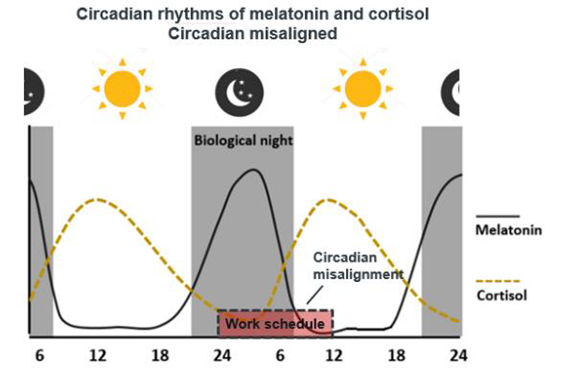 Diagrammatic examples of the circadian rhythms of cortisol (hormone related to stress and activity) and melatonin (night hormone and powerful antioxidant). Our circadian rhythm ensures alertness, concentration and other aspects of performance to be the highest during the day. In addition, it makes us feel sleepy at the late evenings and ensures that we can maintain a solid sleep during the night. During the abrupt transition to a night working schedule, the sleep and wake timings of our biorhythm become misaligned with those of the work schedule, this is referred to as ‘circadian misalignment’. Working during the biological night is ill-advised, but sleeping during the biological day is also a cause for concern. Sleeping during the biological day decreases both the quantity and quality of sleep. When sleeping during the day, people spend less time in the restorative REM sleep and deep sleep, and tend to wake up more frequently (Scheer et al, 2009; Vyas et al, 2012). Each successive period of sleep in the wrong circadian phase can build up a chronic sleep deficit (or sleep debt), which further increases fatigue and decreases alertness during the following shift. Shift workers who are circadian misaligned (i.e. unadapted to the shift work schedule) are active during parts of their biological night and have to go to bed when their body tells them to remain active (see the figure above). Their bodies are preparing for sleep when their schedule demands work, leading to significantly lower performance. This is supported by an increasing number of studies which show that alertness, cognitive capacity and vigilance of unadapted shift workers is impaired. Job performance suffers as well, leading to a decreased work rate, more quality control errors and accidents. An elaborate meta-analytic study has shown that unadapted shift workers have almost a third greater (28%) risk of work-related accidents (Folkard et al, 2006). 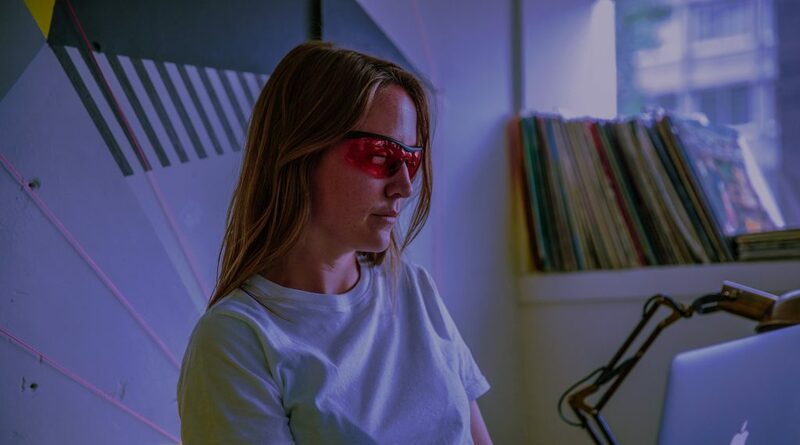 In many of our projects we apply special blue light filtering Somnoblue glasses that stimulate the natural production of the ‘night hormone’ melatonin. So far, we have implemented them at law firms, offshore organizations, health care (source: nursing), consultancies and top sports (source: AZ Alkmaar). Guidance and training is provided to take all these sleep higiene, fatigue, circadian rhythm and light treatment factors into account. Our projects involve supporting employees with one or two workshops on how to apply effective sleep hygiene strategies and how to use the light treatment methods effectively. Proper guidance and training is essential in order to raise awareness, teach knowledge and skills, and raise motivation. The main focus within our workshop is on how to maximize brain potential, performance, health and safety through sleep enhancement. Our references include offshore operators (Bluewater, Allseas, Seaway Heavy Lifting), lawyers (DLA Piper, Hogan Lovells), consultants (Audittrail), soldiers (Royal Netherlands Air Force), and professional athletes (24 h of Le Mans winners, AZ Alkmaar, ADO Den Haag, KNVB). The reduced number of suboptimal sleepers will contribute to increased productivity, performance, and safety outcomes. In addition, the sleep-related medical and absenteeism costs will be reduced. This means that optimizing sleep not only enhances wellbeing and safety, it will also have a direct financial benefit. Enhanced sleep quality will immediately result in improved work force alertness, problem solving, memory, and situational awareness, leading to a reduction of human error risks. In addition, communication skills will go up. Overall, a safer and more efficient work environment is created. Many of the major restorative functions in the body such as tissue repair, muscle growth, immune system functioning, and cleaning of the brain occur during sleep. Enhanced sleep quality of the workforce ensures a more optimal physical and mental recovery, helping them to remain fit and healthy. Sleep enhancement has direct effect on mood and mental well-being. After a good night’s sleep, employees will be in a better mood, will be more resilient towards stress, and can cope better with negative events. Overall, better sleep leads to better physical and mental well-being.